I don’t know about you, but after this week I am feeling the itch to get my SPRING CLEANING groove on! And I know just where to begin- MY CLOSET!!! It seems like my closet is the place that gets neglected the most. (Who really sees it right?) My problem is, I have a hard time letting go of my wardrobe. I am always thinking of what I could turn an old shirt into or what I could do with an earring that has lost it’s match to create new fashion and style. But um… let’s be honest- I never find the time to execute all those ideas, resulting in a closet that should be turned into an episode of Hoarders. So, I created a system that finally seems to help keep my closet organized and also saves me a ton of time in choosing what to wear! Your closet holds all the possibilities of creating fabulous combinations with your wardrobe- don’t you want to make it easy to find what you are looking for? Remember this rule: if you haven’t worn it in over a year- donate it. Okay that is a lot easier said than done for me- but I can tell you how great it feels to clear out and make space in my closet (for possible new items?) and it gives other people a chance to buy clothing. Remember you can also take those hardly worn items to a local consignment shop to cash in for a little extra spending money! One additional tip is to use a different color hanger for items of clothing that you are unsure about keeping. If you don’t really wear it in 6 months- donate it! It may sound a touch OCD but trust me- it will save you a ton of time! I have been color coordinating my wardrobe since the day I started to dress myself and it has been a practice that I have found really helpful when choosing what to wear. When you have your clothes hung up in similar color and style then you know right where they are ! I usually put the more basic colors (black, white, and grey) up front for easy access. It makes matching clothes a breeze! 3. Hang….but WITHOUT wire hangers. You can hang just about everything!!! With the exception of knits and sweaters! It is better for those items to be folded somewhere in your closet! And TOSS OUT YOUR WIRE HANGERS! It was the first thing I got rid of when my husband and I got married and he brought home all his clothes with wire hangers! (I think he questioned who he just married there for a moment) But wire hangers should only be used for roasting marshmallows or fishing something out of the toilet! That is it! Not to mention that they are really hard on your clothes and are not meant for long time use. So, if you can, invest in some nice wooden or padded hangers. Or if you think you will be hanging a lot of items pick up some plastic hangers- they usually are just barely over a dollar for 10 hangers! I also purchased these clips at Target that you can add to your hangers for skirts or pants. 3. Invest in organizing containers. I found this at Target and found it to make a great organizer for my tights and leggings. I got this at Ikea and like to keep my flats and flip flip shoes in it to save space and easy access. I got this at Target and use it to organize jewelry. I love how little room it takes up and how I can see everything at a glance! It is also double sided! I like to put my scarves and bandanas on tie racks. Ikea also has a great hanger with circles that you can put your scarves on. I am trading out the winter scarves with sashes and bandanas for summer! I like to keep some of my taller and maybe more delicate shoes in clear plastic bins that I picked up at Costco. 4. Keep everything at eye level. I am not exactly very tall and find if I put something high up on a shelf where I don’t see it- I forget it’s there! Save that out -of-reach space for storing out-of-season clothing instead. I like to keep my jeans and t-shirts folded at eye level for an easy view. 5. Keep tabs of your favorites. If you are the type of person who has a hard time deciding what to wear or knowing how to match your clothing- try grouping your favorite outfits together and hang it up in a part of your closet where they are easily accessible. Then you can pre-plan for special events or for busy days. I love hooks- they are not very expensive and you can put them just about anywhere in your closet. They are so perfect for hanging belts, hats, necklaces, and just about anything you want. I have a few behind the door and in areas where you would never think to put anything! It can keep things from being left on the ground. Hopefully this has inspired you to get started in re-working your closet space and therefore, re-working your wardrobe! Now I am off to finish organizing and de-cluttering! 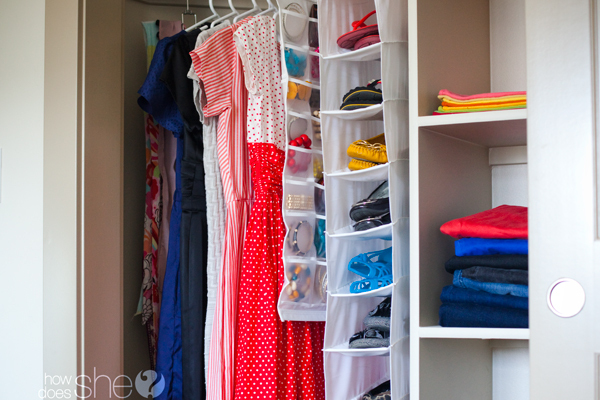 What are your secrets to organizing your closet? « Trash to Treasure with the Picker Sisters! I also do the plastic hangers and hang by color. But that is where my organization stops. These are fantastic ideas and I love your visuals – great colors in your closet! Great tips! …I just wish once I organize the closet it would stay that way! LOVE the ideas…now will you come and do mine? 😉 I need to go get clips for my skirts and pants at Tarhet….that has been an idea a long time coming! I know…it is the hardest space of my house to keep clean! Cristi – love the tips! Now, if I could just get you to come and fix my closet for me! ;)! Oh – here’s a request – next up – do the pantry! “simplify” is the best advice of all — thanks for the reminder!!! Yeah Cristi! I just went through mine and got rid of so much…maybe too much but it felt so good to get things out of there! Wow, I wish my closet looked that great. I love the tip on the hangers. Keep it clean is the challenge… I am adding tip #7- hire someone to clean it for you. Haha – I had to search my closet for a wire hanger to fish a bar of soap out of the toilet the other day – luckily there was ONE random wire hanger in there. So helpful! Thanks for the tips…the colored hanger idea is super! Cristi–Ok, you’re hired!! That looks amazing. Thanks for the great tips! The colored/notsure hanger is a great idea. I have all white and one pack of red would help a ton. I haaaaaaaate getting rid of clothes, and I interviewed a consignment store owner downtown a few weeks ago. I definitely got the motivation to go through and try to get some cash or credit for clothes! I love how clear the steps are- investing in organizers is such a great idea! I have a huge mess of a pile of socks and tights that could really use some organizing. Thanks again Cristi! I love it, and I going to start tomorrow to clean my closet. So excited! I love the ideas i need to start now!! remember that time that i made all those hooks and hangers for you so you could hang up your necklaces and belts and all that stuff, and then you did a post on it and showed me no love. I see how it is. no more hook hanging for you. thanks for organizing the closet. it looks super sweet. It is true- I can’t take all the credit. You, my handy and incredibly good looking husband did put up the hooks. You are the best! P.S. I think I just may need some more hooks put up so I can hang my purses next!…;) Did I mention you are incredibly good looking? I love the organizers that you have for your jewelry, scarves and belts! Putting those on my shopping list for sure. I love that you included where you found the organizing equipment – i.e. boxes, hangers, etc. I think about doing things like this, but I don’t know where to find the tools. I especially like the storage for tights and socks. i love the idea with the red hanger! i always hold onto those clothes that i know i won’t wear.. except for maybe that ONE exception where i’ll probably want it! and those are very rare occasions. Love the post girl! I have gone over my closets once a week to clear it out and I think I have a few more times of going over it before I have it ready. Way to go Melony! I am on a purging kick lately! It is so fun! The hooks for all of my necklaces will totally save me! This is such a great post! I had no idea I wasn’t supposed to hang my kints! What do you do with all your cardigans sweaters and t-shirts? I feel like if I folded them all and put them in a drawer I would never be able to find what I’m looking for. Granted the majority of my wardrobe consists of knits and sweaters! Any suggestions? Hi Samantha! I fold mine and stack them in my closet. However, as soon as I stop wearing the sweaters- I store them for the winter. Then, when winter comes, It’s like Christmas with a whole new wardrobe I haven’t seen in months! I personally like to keep all that I wear regularly in my closet so I can see it all at once an piece outfits together. If they are in the drawers I forget they are there. I only have my underwear, pjs, socks, and workout clothes in my drawers. Plus- my drawers always seem to get messy! Hope that helps! Thank you thank you Cristi!! One quick question, that. Accessory holder that you got from target… What is it intended to be used for really, I couldn’t find it in the store.. But maybe I looked in the wrong section? I own a custom closet company and I see a lot of posts about how someone has tried to make their closets more effective. Most people don’t have a clue and put poor information on their posts. I’m terrifically impressed, however, with your post! You gave some great information and it was well written to boot! Good job!!!! Bonnie- I am so glad you approve. How cool- can’t wait to get inspired from you and see how I can make it even better! Oh girl, if that is all the t shirts you own, you are deprived! Ok, I know I have too many clothes, but how do you get by?????? Haha it is true. I don’t wear a lot of t-shirts- unless it is under something else. However, I did have to take out a portion of my clothing photograph it to get it in the frame- so I took some out to show a section just to show color coordination. I turn my hangers backward when I hang my clothes up. I also Post the date in my closet. 6 months later, anything that is still backward, GOES. Love the idea of the posting of the date in the closet! I am going to do that! I love finding people like me. I love organizing. My closet has been color organized my whole life. Whites, off whites, tans,browns and so on. Looking at your closet is almost a mirror image of mine. I don’t even own a dresser. Just shelves in my closet. I can add the suggestion of a bulletin board on the back of the closet door to hang jewelry. I also have my jackets in a cascaded pattern on the back wall with those hanger things so you can hang another hanger on a hanger. I can see all my jackets that way. I almost have my husband kicked completely out of the closet to another one in our house. When I do what a wonderful day that will be. I think I will take the day off and reorganize. I think I will take the day off and reorganize with all your great ideas! Thank you! I love these ideas, timing was perfect too because my closet is suffering severely. It looks awful and I feel awful when I walk in there! I loved the tie rack idea and I guess I’ll be color coordinating dangit, but it looks awesome. Thanks for the great ideas! On a side note: Where do you get all your clothes?! What are your top 5 favorite places to shop. I love how colorful your wardrobe is…I’m a redhead and somewhere along the way got stuck thinking I couldn’t wear read or pink and that brown and green were my best bet. After watching Confessions of a Shopaholic I felt claustrophobic with my wardrobe and needed to branch out fast! I would love your insight to affordable, fun, and colorful clothes! That question is a tough one to narrow down to 5… but I do a lot of clearance shopping to keep it affordable and my top favorite stores are usually ones that I can also shop for my little man at the same time- so in no particular order I love anthropology, Zara, H&M, Forever 21, Target, Tjmaxx, Nordstrom Rack, and any thrift or vintage shop I can get my hands on. I don’t like to spend a lot on my wardrobe so I don’t get too attached…then I can always recycle and keep it updated!! And I love Red and pink or redheads!! 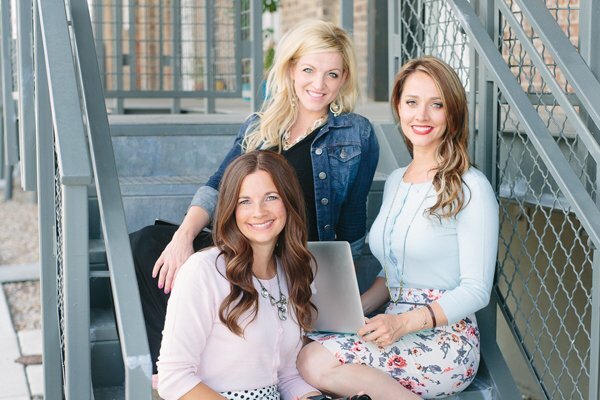 What a great article, thanks for sharing! I also have a hard time parting with the old clothes, the red hanger idea is awesome. It would probably be pretty revealing as to just how much space is lost to “maybe'” items. Searching in Yahoo raised your web blog – I’m thankful it did, many thanks. When I clean out my closet I move unwanted things to anther room, boxed up the “for sure going to go” items and keep the “not so sure I am ready to let you go” items hanging for a few months or so. Gives me time to really think about it and go retrieve items as needed. Only once have I gone after a pair of pants. Once a year my girlfriends and I get together and clothing/accessory swap. Everyone goes home with a new item or two (or 10) and the rest gets packed for our local donation center.